I have had a minor posterior disc bulge since 2001 when I was in mid-twenties. It used to kill me and the pain was very localised to the disc area on my spine. I was tried on various drugs such as Gabapentin, a new neuropathic drug at this time, which failed to help. Neither did Amitriptilyne. I did increase exercise, but that didn't help so much. The Bowen Technique was helpful for the pain, but it wasn't until I started to have intensive physiotherapy in 2008-11 that my back pain was really 'sorted' and that involved doing a lot of core stability work and retraining, which was hard and painful at the time, but radically improved my pain. I still had bad times with endometriosis until I had a total hysterectomy aged 39 and was then put on Oestrogen HRT patches which is supposed to stablize hypermobile joints, rather than loosen, as progesterone does. Fast forward a few more years, and I am now 43 and as of three months ago, I start to get more lower back pain which is in the trunk, rather than in the actual spine. I start a campaign of Pilates and core stability exercises, but in walking, these deep core pelvic floor muscles are no longer firing well, yet I have no idea 'where' they have gone! My back slightly improves over time and then as we get to the end of May I have a major flare up of back pain that is localised to the spine and that old disc. I had by this time ordered a spinal support 'wrap' and wore it only a few times, whilst continuing with a 15 minute daily programme of Pilates/old Physio exercises. A few days later I woke up with pain radiating down my left leg. My first thought was that I had forgotten to do some Piriformis stretches the day before, so it was my fault. (My piriformis is always tight!). I managed to walk in town, but was aware that my left leg didn't feel quite right, but the pain in my back had eased. I was then going to have my hair cut, and I remember this spot in my gluteals (where the sciatica nerve would pass through) was very painful, and sending radiating pain down my left leg. It was hard having to sit for so long. The following day was even worse, and without knowing it, I was actually walking on the lateral border of my left ankle, rather than through my left foot as I had unknowingly lost sensation in my foot. By the next day I had severe pain in my tibialis anterior and peroneals on the left leg from walking so strangely the day before. My proprioception had badly let me down. I tried self-treating. I got some stronger anti-inflammatory medication, did some Bowen on my leg. My Osteopath was away and so I received a visit from a GP via NHS111 who wanted me to go to A&E on account of some loss of sensation in my left leg, as well as the radiating pain, which I suspected was entirely related to that old disc prolapse. The following morning, at just before 9am on 1st June I arrived at A&E. To be honest I thought they would fairly rapidly dismiss me, reassure me it was sciatica and to keep up with moving about and painkillers, but they didn't. By early afternoon I was being assessed by the medical doctors (rather than surgical), following A&E doctor triage. The medical team were a little baffled by the lack of sensation in my medial calf, and at some points on the edge of my left ITB. They then returned and told me I needed a rectal examination, but I knew why this was. Anyone who has problems with lack of bladder and bowel control, and it is immediate concern for a condition called Cauda equina syndrome, which is a rare disorder that usually is a surgical emergency. In patients with cauda equina syndrome, something compresses on the spinal nerve roots. As I could feel the rectal examination, this could eliminate Cauda equina, fortunately. A short while later the medical doctor came back to say that they were admitting me and that we were waiting for a bed on the ward, and that I would be admitted for pain management. They had also used my 'Care Plan' document, and it was very clear they were implementing it. From my point of view this was a real 'thumbs up' moment in that the healthcare professionals were trying to do their best for me and my wishes, although I was still surprised they still hadn't sent me home with painkillers. By c5pm I reached bed 7 on my ward. I was very impressed with the care shown and treatment in this hospital, it far outstripped other hospitals I have attended (barring one other). I was later asked to try and walk down the corridor in the ward with a senior registrar. Despite the fact I was limping very bad (more, staggering than walking), he said I was doing really well and that he wanted me to keep mobilizing in this way on a regular basis. The hospital took advice from my pain management consultant at another hospital who created a regime of 20mls of Oramorph every 2 hours. This was fully implemented by the Sunday, and then phased out through Tuesday and I was discharged from hospital on the Wednesday, so it was a five night admission in total. Whilst I was in there I was asked my advice about what I would want from an inpatient advice book, and helped with this work. I had a few visitors each day, and although I couldn't walk well, and other patients kept on suggesting I used frames/crutches I had been asked not to. Some people questioned why I was admitted at all, and why for so long, including such a huge increase in opioids. This is a good question, although I did manage to sleep well in the end, something that has been a big problem since I got home. I had an MRI when I was in hospital which indeed showed that the nerves exiting from L5 were compressed, so the disc had worsened, nor surprisingly, since the last MRI in 2015. The day after I got home from hospital I went to see my osteopath. I told him the whole story and he spent most of the session addressing my left glutes, ITB and peroneals/tib anterior. He suggested that I only did 'the clam' and 'cat' as exercises at home, in addition to regular 'short walks.' This I followed to the letter. I am still unable to do pelvic tilts, stretching my left piriformis is still too painful, and I still have bad radiating pain. Apparently it could be several weeks before I am walking properly again. I can walk OK for about 20 minutes, and then I can no longer walk through the left foot, without it simply slapping on the ground (like a 'dropped foot'). I am about to go for a follow up Osteopath session. I have also discussed the idea of some one-to-one Pilates sessions again whilst I am in this acute injury phase. Another therapist I work with said that he also feels there is a further emotional underlie going on here, and that might have contributed to what I called the final swansong, when the pain had gone down my leg. 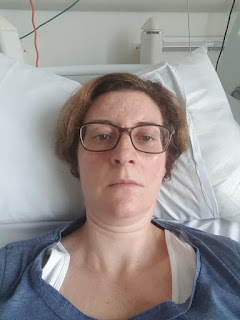 Just at the moment I feel a complete crock what with all the problems I have in my arms and shoulders due to my bone tumour in the right proximal humerus and also strongly suspected 'Thoracic Outlet Syndrome'. This is really upsetting me as I play the recorder, sometimes quite well, and was offered to do some recitals this month and had to turn them down owing to the pain that the additional practice and rehearsal might cause. All is not well for me just now. The need for constant rehabilitation - ongoing exercise regimes! 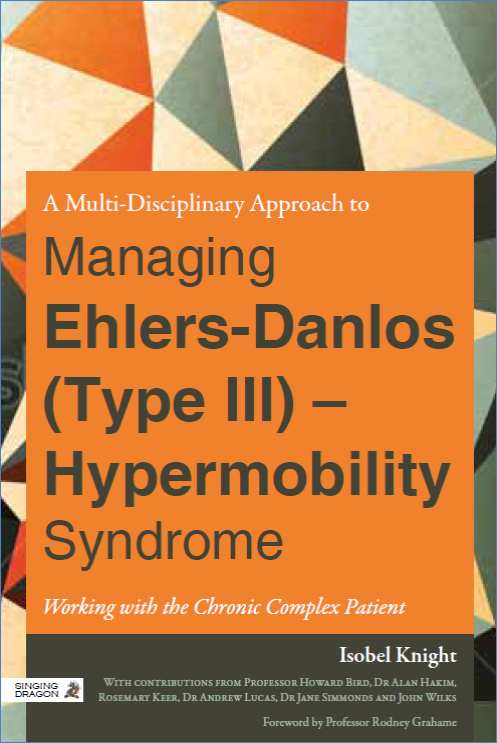 One of the biggest problems with Ehlers-Danlos Syndrome - Hypermobility Type (EDS-HT)/ Joint Hypermobility Syndrome (JHS) is that the management needs to be continuous. It is a life-long condition, meaning that the ligamentous laxity remains (although declines with age), and it is a heritable disorder of connective tissue meaning that the collagens continue to reproduce in a 'faulty' way. This means that the risk of injury is never far away because of often widespread joint instability, pain caused by overworking superficial muscles, and frequently a lack of firing of the deep core stability muscular system. The cycle of a manual therapist (usually a physiotherapist) releasing off the tight superficial muscles is needed in order to relieve pain, whilst the patient needs to work to strengthen (in particular) the deep core muscular system to help with joint stabilization and to maintain the range of movement that is natural in a hypermobile body. This loss of the full range of movement in a normally hypermobile body is something that undoubtedly leads to further pain, and many hypermobile people complain of 'feeling stiff' as a result. Whilst the over-worked muscles may receive manual therapeutic attention, it is the job of the patient to strengthen and this whole process is cyclical and seemingly never-ending. Of late I have experienced such arm restrictions that I was neither able to adduct my arms (lifting sideways), lifting my arms forward, and hardly any movement on extending my arms backwards. There was simply no strength in my upper body to support my arms let alone allow for any, let alone my usual 'hypermobile' range of movement. There was also absolutely no strength to the extent that I couldn't even hold a newspaper. Tasks like drying my hair had become virtually impossible, and my desire to garden all gone out of the window because I could only manage to trowel out one weed! I thought I might need to contact my (old) physiotherapist because she was so skilled at helping me, but as this was not possible for various reasons, I had to look at my blog and my books and see if I could find any answers in the form of exercise management. Interestingly Bowen Therapy had helped with my spinal extension, but now I needed to do a whole batch of exercises, and I knew this, in order to give myself any hope of gaining any upper body strength and stability and so I could also improve my arm range of movement again in all planes. Luckily I came across about 8 exercises, and even after a week my range of movement has improved, and already tasks like drying my hair have become possible again. I have also been doing remedial work on my neck, and since everything is joined onto another piece in the body, therefore no part can really be separated, this is important as the neck work will also support the shoulder/upper body work. In addition I also have to continue doing gluteal strengthening work at least 2-3 times in the week. It is a big ask. I also aim to walk for 30-60 minutes a day and then try to fit in some ballet. So I have written this to show just how dedicated the EDS-HT/JHS patient has to be, and how commitment from the patient is so necessary in order to manage the condition. I will of course check in for some more treatment - be it Bowen, Osteopathy or Physiotherapy, but the hard work has to come from me. On that note, I must sign off and get started on my 20-30 minute program! Over the past 3 months I have had 3 separate hospital admissions, some of lengthy duration where the condition Abdominal Cutaneous Nerve Entrapment Syndrome (ACNES) was missed by general surgeons, colorectal surgeons, gastroenterologists, rheumatologists, gynaecologists and pain management experts. I go to another hospital for a follow-up out-patient appointment where the gastroenterologists are EDS experts and lo and behold in a very short time, ten minutes - a diagnosis is made of this peculiar, although by no means recently discovered condition (1924). I had to perform a sort of physio assessment by getting into various positions, going into forward flexion, rotation of spine, extension of spine as well as doing things like pushing my legs against the doctor, and other similar movements. This was to see if the pain was triggered. When I saw my osteopath later in the day, he also did a further assessment of getting me to raise my head and aiming one elbow at a time towards my knee. This did bring the pain on a bit. The treatment (and there is some) involves a steroid and local anaesthetic into this nasty trigger point which is the result of a nerve that has come from the spine and wrongly deviated into my abdominal muscle (most likely rectus abdominus), and on palpation feels like a pea deep in the muscle. I could always located it exactly on palpation, as is typical. I am also to have some manual therapy and trigger point work in the area, which I have begun. Anyway, despite numerous investigations (MRIs, CTs,Ultrasounds) this was finally picked up on simple palpation and some movements. I nearly cried with relief when I received the diagnosis. At least I know my pain is not sinister and can now be managed, also with pain relief, I will also be doing some Bowen therapy work on it too. During my first osteopathy treatment, O (Osteopath) performed general palpation and gentle massage around the area - O was able to locate the spot(!). O also had to do work into my inguinal ligament and into the top of adductor longus as well as work in the diaphragm. Immediately following the treatment, I felt higher up on my hip and out of my hip (taller). The day afterwards things were fairly 'quiet' with the pain location going up to about a 3/10. I was then OK for another day before hitting a massive fatigue and the pain score rocketing to a 6/10 which came mainly from my lumbar spine in my disc bulge/hinge at L4/5. Side flexion was agony. I managed the day with heat - hot water bottles and pain killers. I then saw O the next day. In the next treatment session O gave me an exercise for my hip to encourage movement which is very limited (internal rotation). O then worked on my back before going back to the pea-site of the pain. There were definitely some ouch movements. O also worked on my upper back and trapezius. The next day I hit a big fatigue which improved thankfully throughout the day. My upper back was also in terrible spasm. Today I am relatively pain-free, and less fatigued. I will keep you posted over the course of the journey in my treatment with ACNES. A Guide to Living with Hypermobility Syndrome - Bending without Breaking. 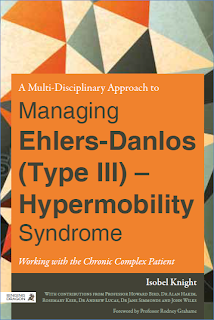 A Multidisciplinary Approach to Managing Ehler-Danlos (type III) Hypermobility Syndrome. I received a feedback comment today from my last post which is dated 1st December. I think that the reader was wondering how I am now, given my lack of blogging. I can confirm that I am doing very well in a musculoskeletal capacity, at any rate. I have had 4 Osteopathy sessions since 1st December, so over the last 5 months, and usually it is to release my piriformis muscles, which are so tight and constantly overwork (bilaterally). For those of you who don't know, the piriformis muscle is a nasty horizontal muscle deep and under the gluteous muscles and can actually squash the sciatic nerve, and generally cause a lot of pain. I do regularly stretch the blighters, but they can still cause extreme pain. I also have osteopathy if my back becomes particularly inflamed and has remained so for more than a couple of days. I then also have my upper traps released and sometimes some manipulation of my thoracic spine to improve it's mobility. I am still having to work on my medial rotation, which is so restricted, and important in walking and in fact in anything other than ballet. I am improving the use of my hips, rather than "fixing" them when I walk. I walk so much better now than I did years ago when this blog begun. I owe my help to two physiotherapists and my recent osteopath. When I am not having osteopathy (or physiotherapy), I also self-treat myself using the Bowen Technique, which I also practice. This is excellent and keeps things at bay for a lot of the time in between sessions requiring some deeper work. I have been a Bowen therapist for 11 years now and predominately work with those who have Ehlers-Danlos Syndrome- Hypermobility Type (EDS-HT). In short, I am continuing to do very well, and I am extremely lucky. I had a small overnight bag (OK - it was heavier than it should have been). I bent down to retrieve my post, bending diagonally. The force required pulled me to the left and I felt something 'go.' I thought I would get over it until I was holding my new niece for some time on a low sofa . I felt the muscles in the area go into further spasm. I moved about, knowing I had 'done something' more to my back than the usual muscular aches. I had, in the morning, applied kinesio tape to my back, for the sake of the pain in my 'hinge' at L4/5, but it had not helped this more acute incident. Over night I had more pain and despite glute stretches, there was a slow and gentle throbbing sensation which went into my left buttock and gently down my left leg. I knew I was in trouble when I was struggling to weight-bear on the left leg, but sitting was also very uncomfortable. Luckily my osteopath had space to see me much later in the day, so I was most glad. He said I had strained a facet joint pulling on the adjacent and adjoining musculature and it was all inflamed (no kidding!). A treatment ensued with the request to ice, drink plenty of water and to use heat pads. Cracking Thoracic Spine - Literally! I saw my lovely osteopath today. I said that I would like to include osteopathy (and acupuncture) in my update of the book I had published in 2011. It is really good to have found someone who is a) really good and b) is aware of working with both dancers and people with EDS. I was videoed walking. On the first go, my legs were more medial than was normal (and certainly normal for me). I explained I was trying so hard to use medial rotation and my adductors! On the second go, it looked a little more normal, but still not showing a very natural use of hips. I was given some things to do with my feet and then I showed my exercises to T before there was a plan of action for my very tight thoracic spine and ongoing glut medius and overwork right hip and underworking left gluteal. I actually got "cracked" today at T8 and somewhere else. It felt good, although a bit scary, but it was so tight, something had to give. It is the first time in about 20 years I have allowed someone to "crack" my spine, but it was about stiffness in rotation and it did help to free things up. Some of the manual work was more painful, especially the work on my medial rotation which is so jammed to the right. I left with more exercises to build on the Feldenkrais work of allowing the hips to tilt up and down more naturally. I have to continue with my calf work and lunges. It was a good session! After a good catch-up, Maggy begun to work on me, doing a session that was aimed at freeing my hips and helping with improving my use of hips pelvis and to help with walking. Such as the one-to-one work in Feldenkrais, it seems that as the recipient of treatment, that I am doing absolutely nothing whilst the practitioner does all the work. Not entirely so. I was very much processing what Maggy was doing. It was if my brain was listening - certainly my ears felt active, but I was "hearing" the work deep inside my body. The movements are incredibly gentle and the Feldenkrais is working on improving the relationship of the bones, rather than necessarily the muscles, although of course the work is very holistic. In fact, I was having sensations on my head and neck when Maggy was working on my feet. The work is almost playful because Maggy is just coaxing the joints to articulate in a subtle, yet different way. Maggy started by working on me with me lying on my left side. I then lay on my back to compare the difference before she worked on my right side. By the end of the session, which must have taken towards an hour, the right side of my body (the actual shorter leg/side) felt much longer than the left and then I went to stand, which was interesting. My right knee felt a little more vulnerable - initially since it had its full range of hypermobility fully restored, but this certainly felt OK - I didn't feel unstable. However, upon walking my hips were going up and down and there was far more 'articulation' in the pelvis and I had an improved tilt in my pelvis, improved belly breathing and increased sensation and use of my feet. I am now a little tired, which is entirely normal following this work, but my body feels better and freer for it and I think it will be interesting to explore walking with my 'sexier' hips and allow the muscles to relax off that are keeping the area in such a held way. If you haven't yet had Feldenkrais as a one-to-one session or Functional Integration® (as it can also be taught in class settings) I would highly recommend it. Maggy Burrowes website is http://www.vocaldynamix.com/index.html and she is a lovely person and as I say, very knowledgeable about Hypermobility Syndrome and also works a great deal with singers, being a singer herself. As a result of my work in parallel and strengthening that alignment, has actually reinforced the strength in my core stability and in dancing as well. I have, for sometime, been experimenting with the order of the classical ballet barre and have made many changes to the order of the class as well as mainly doing the barre work in the centre (e.g. with no support, except for 2 exercises). I need to continue my adage work, and urgently need to work on pirouettes and allegro. I had some more work done on my TMJ and now have an exercise to strengthen the right side of the lower TMJ to try and stop the deviation to the left. I had no spasms during treatment and no reactions of any (negative) kind the next day. This might really get sorted out. I must still get my orthodontic appliance reviewed. I saw my Osteopath yesterday (change from physio) because I was getting some sciatic symptoms on the left leg. I imagined this was a partial result of the new hip exercises and work given to me by my physio, but it was going to be much easier and quicker for me to see the osteo, who is lovely, like my physio. The osteo noticed similar things about my hips to the physio and said that periformis was massively overworking and that my glut max and other gluteals were doing very little. He watched me performing some developes and other movements and then worked on my gluteals and some of the discs in my spine which had become irritated and in some pain - notably L2/3. After this I was given two new exercises which complement and take further the exercises I was recently given by my physio. One involves pointing my foot around the face of the clock so for right leg pointing at 1pm, 3pm 5pm etc and left leg at 11, 9, 8 etc. I have to do the left leg twice over because it is not as good as the right one. The second exercise involves forward lunges ensuring I rotate my trunk and use my hips and that my knees are pointing medially with my head straight forward. Again I have to do more reps with the left leg in extension as it is not tracking as naturally or correctly as the right leg. Following doing all my physio and osteo exercises I went on a walk and was really focusing on keeping my left leg tracking medially, rotating in my trunk and swinging my arms and then using my hips and toeing off. It was a lot to think about - it is amazing just how complex walking is as a movement pattern. By the end of the walk (about an hour) my TFL and adductors had really had enough, but I could feel my trunk working properly and some hip hitching and rotation movement. I then did some adductor stretches and then was really annoyed at how tight my hamstrings felt! I am now quite fatigued, but that was a lot of new movement patterning. Think my spine, adductors and hips will be rather sore - just more training pain! It is interesting seeing two different therapists of two different disciplines, but even though they don't know each other they seem to complement each other very well. I would love some Bowen too at some point! I had a hospital appointment with the lovely Dr E and he has suggested that I need to stop having any manual therapy for the moment and so physio is presently suspended until further notice. I wasn't very happy about a total ban on all manual therapies as my upper back and neck need attention, so will continue having Bowen Therapy which is less risky for the area, it seems, than physio. Dr E has said he will send me to a Neuro-Physio if my movement disorder persists at its present level. We have agreed I am in a flare-up situation, but that it should settle, as it has been before. He will certainly see me again sooner if there is a problem, or send me to neuro-physio. I can continue taking medications, as appropriate. A few days prior to seeing Dr E I did some Mind Body Bowen work on myself which gave me another beautiful emotional release. Everytime I do this I get just a little bit better. Ten days after my last physio appointment and things have now really calmed down and there are no spasms, but just muscular tightness and tension. Bowen required and lots of sleep! I had a physio appointment today. Things have calmed down a great deal over the last two weeks with deep-core muscles really kicking back in making my life much easier. I think the swimming and Biodanza helped with that. Despite a day of the most awful and screaming arm pain and two days of fatigue, things are better, but highlighting problems in my thoracic spine (getting very hunch-backed) and also arm-pain. M did some work into my neck. In occiput - and extension in that area, there is no problem, but around C4-7 in neck extension things really kicked off huge muscle spasms. He did work on scalenes, ribs, traps, and has requested me to spend some time on the overball working on my neck extension, imaging if need be to start with if muscle spasms and twitching are rife. This area and thoracic are the last bastion now of my treatment - now almost 5 years later!!! My 'Deep Back Line (Myers) has been over-working for the past 6-8 weeks and has been in spasm on several occasions. I have had sciatica as well and have had some Osteopathy sessions, but the pain has returned and Bowen has held the fort, but today I went back to my physio for a crisis review, as my pain was terrible and was getting beyond a state of functioning. This has been the case over the last few weeks in terms of a decline in energy, an increase in fatigue and a decline in mood and becoming socially isolated because I have no desire to do anything. This has (largely) stemmed from deep-core muscular failure which my physio said might have also been triggered by anything - including a psychological event/incident. This, I can quite possibly relate to a very difficult time in psychotherapy. The result now is that despite a week of very intensive Pilates from me and ongoing attempts to kick-start my deep abdominal muscle have failed. My tummy is sagging and I have gained some weight and I constantly want to be in a forward flexion position. This is a typical movement pattern for me and one in the past we have tried to get me out of - but it is obviously bought out when I am threatened. My balance on both feet with my eyes closed bore this out - I had no sense of control and was tipping backwards. When I stood further forward, which would be the correct position, it felt like I was falling off a cliff! This is the trouble with HMS and problems with proprioception, as well as the deep-core muscular failure. My physio did a lot of work on my back and relased off many incredible points of pain. He then taped my back up and he has asked me to go and get a swiss ball to sit on as much as possible and to go swimming - but to do specific exercises - anything that might get the deep-core abdominals to fire. Until this happens any further progress is entirely hampered. I really hate being in this state so much, and spending time having to catch up again before I can make progress. I am having more physio next week. I said to my physio that a whole 3 months without any treatment was definitely too long. In all honesty, even when I am well, I still require treatment at least every 6-8 weeks. I think this will be how it is forever and ongoing. I had left the Neurology Hospital with a 24-hour BP/HR monitor with a diary and instructions about how to use the monitor and the sorts of things to record in my diary. This started with me recording my BP 5 minutes before eating, then ten minutes after to see how food effects my BP. I then had a very brisk walk to work so these things were all recorded. I did not sleep well that night. Aside from the fact I had a nasty cold the BP monitor was going off every hour, so was waking me up hourly as well! In the morning I foolishly decided to run a few errands in the notoriously busy Oxford Street before going back to hospital. This was definitely a mistake - especially when feeling unwell. I arrived into the lovely calm of the day ward and shown to another nice green chair in a room shared with others having intravenous medications - mainly for MS. I was then taken back to the Autonomic Unit for my final testing situation - the 'feeding' test. I told my scientist of the day that I was not well, but we agreed I could proceed with the test, and I requested to be given a soya-milk complan drink as I am presently on a dairy-free diet. The test started with a few base measurements starting on the tilt-table, in a horizontal position, after this I was tipped again to 60 degrees and left there for ten minutes. I did feel some fatigue and nausea, but not much else. My scientist then bought me back to horizontal and then fed me two plastic cups worth of the liquid meal I had to consume, whilst lying flat, and I had to drink the meal through a straw. It was strange doing this, but I managed to swallow the drink, which tasted quite pleasant. I then had to wait 45 minutes in order for the drink to be digested, but had to remain on the tilt table, horizontally. I was covered with a blanket and said I would probably fall asleep - although I was asked to 'preferably' remain awake to avoid my BP dropping, as would be the case if I slept. Sleep, it seemed, did not feature in the agenda, particularly with a BP monitor going off every 5 minutes. My HR rocketed and I started to have palpitations. This went on, past the repeat of the ten minute tilt-test and actually went on for several hours after the test. This was not something I expected to happen, neither did my scientist. Although people sometimes do have palpitations (as per having POTS) they don't normally last too long. I had to be taken back to the ward and further monitored for a few more hours. My 'resting' heart rate ranged between 80-110 beats. As a precaution I was also given an ECG, but this was normal. I was also given more food in order to try and stabilise me. I did eventually feel better and got home at about 8pm. I should imagine the fact I had a bad cold and chest would have possibly had an effect on my tests and their outcome. However, I will definitely say that this 'Feeding Test' was no where near as bad as I had expected, even despite the outcome of my testing - which was unusual. Nobody should worry about this test or indeed any other POTS testing. I get the results of my tests at the end of the month. Everyone was absolutely lovely at hospital, and nobody should worry about having POTS testing - although some aspects of the testing are slightly unpleasant (as in my Day one experience) nothing lasts too long. You will be fine, and they will really look after you even if something strange does happen! At least it is not like being at A&E where nobody believes your symptoms or thinks you are making it up! I finally had my long-awaited POTS assessment at the National Neurological Hospital in Queen's Square, London. I had been put on the list two years ago, but deferred my original assessment appointment because I was so worried about having the Tilt Table test at the time - although in fact nothing was done other than a blood pressure and symptom history - back in February. I had deferred because my physio and I had been concerned about the testing making my symptoms worse. Then would have been the time for the tests! As a result I feel that my symptoms are much less severe two years later, so am not sure how much benefit will be gained from the tests - other than my ability to contribute to their research and for me to document the experience now. I woke yesterday morning with the symptoms of a cold and had a sore throat and cough all the previous night, so was not feeling well. I reported this to the nurse who met me on the ward. It was strange being admitted to a ward where one is a day-patient. Nonetheless upon arrival my blood pressure was taken, and an MRSA swab as well as the usual clerical details -e.g. next of kin, allergies, wrist-band. I was then taken to the Autonomic Unit and entered a small laboratory where I spend the next four hours. I was asked to squeeze something as hard as possible and hold it there for several minutes to create a tornique. It was quite painful, and I just about managed to do it. All the while BP/HR readings were taken. Next I was asked to do some mental arithmetic. I found this quite stressful at the start of the test, but got into it OK and then it was made even harder. Doubtless my HR/BP readings will bear out this stress. Aftter this I was asked to do some deep-breathing whilst readings were taken. This was fine. The next test involved having two icepacks put onto my right hand, one under it and one on top of it. This was most unpleasant, and again survived the experience. Once I had recovered from this test I had to do a lot of shallow breathing - or hyperventilating. This did make me a bit dizzy/lightheaded. After this I had to go to the bathroom before a few more baseline HR/BP readings were done, and then I was tilted abruptly (though not violently) to 60 degrees. I then had to spend a very long time in this position. I was taken well past the ten minutes - although I was having symptoms of HR and temperature change as well as feeling sick. I then had a cannula inserted and bloods were taken and my response to the stress measured. After I really could tolerate no more and was getting to stage of hypervenilation, I called it a day and requested the test to end (I think he wanted me to hang on a bit longer, but my back was killing me). I was then tipped back to horizontal, though this did not feel horizontal anymore - felt strange. Once a few more readings were done, whilst in horizontal, I was asked to stand still. A few minutes into the test Blood was taken from the back of my hand, rather than using a cannula, which I found strange, but it was another stressor designed to see how I would cope - which I did. After this came the exercise test! The exercise test involved me lying supine on a bed where I was hooked up to another BP monitor and a few baseline readings were taken. I was then positioned into an exercise bike, whilst lying horizontal, which is hard to imagine, but was possible. I enjoyed this test the most of all. I had to cycle keeping the bike at a certain pace. The first level was easy, then pressure was increased to make the resistance harder and I had to cycle for a bit longer and then third level was harder still. I had no problems at all with this test and seemed to recover quickly. The final part of the morning involved me being fitted with the portable BP/HR monitor and being given a diary to complete with various activities for the following 24 hours. I was told how to remove the monitor and what sorts of things to be doing in the different tests - e.g. some sitting, lying, walking, assessing myself before and after food. After this I was able to go to the ward and have my lunch before running off to work - and did a brisk walk there. It was very embarrassing having the machine on me at work as it was quite noisy and sounded like flatulance! Everyone was laughing. By this point in the afternoon, I was feeling increasingly poorly and was very definitely coming down with a cold. I didn't get home from work until just after 8pm and did some more readings in different positions. Bed time was another issue altogether...! I had my final physiotherapy session today. M and I did a lot of talking - actually about 90 minutes of talking with a little bit of physio and much interesting discussion. He agreed with my decision to stop physio for the time-being. Upon reflection, I had now been in physio for 4.5 years and it now feels time to explore other options and let things process for a while. It felt empowering for me to be the one in control over this decision and to stop treatment on my terms and in my way. I am sure I will have more in due course, but not (I foresee) for several months at least. I hope. M agreed with my decision and was supportive about it. He said he often suggests his long-term patients take a break. It is good for both therapist and patient. It feels a bit strange knowing that for now, "that's it" but I have made the decision and it was not one I took lightly. There are definitely new things coming into my life and new healing and treatment approaches. I am looking forward to the future and all that it brings and although this blog is now at an end, I feel I am also (personally) on a new journey. I would like to thank all my followers - and will keep you appraised of other blogs - or you can find them yourself. Where one door closes, another one opens... said someone wise. Over the past weeks I have felt... shattered. I thought it was fatigue. After last weekend's fantastic HMSA Residential Weekend, I am sure it was pure exhaustion, and then I finally realised something else. I had an epiphany yesterday when I felt so laid back I was almost fast asleep at 3pm in the afternoon.... at work. I realised that this wasn't just being tired anymore (although, tired I very definitely still am), but relaxed. I have not experienced "being relaxed" for so long I had long since forgotten what that sensation might be like. I have been running on adrenaline for months and months and now I think that the adrenaline has been depleted and therefore so am I, so the only thing I can now do is rest. It is hard not pushing myself to exercise, even harder when I have gained a bit of weight, but I realise I really have to rest because I cannot push myself any further - there is no adrenaline to do it and I need to give in, slow down, rest and relax. So I am. Enjoying myself in the sun, napping, seeing friends, but also drinking copious quantities of coffee are no longer having any impact - that is how I know I am completely adrenal depleted, and have to relax and rest. · Heads, shoulders, knees and toes – no composer found! The quality of my life has really improved. A major hurdle has been overcome and another one will be overcome by the end of this month. Now I am starting to sound like an astrologer.... I am the happiest I have been for almost nine months. I feel a huge sense of relief and have started to find joy in life again. Several people have commented that I sound like my old self again. It feels good to have reclaimed that person. This weekend although I had some editing work to do I have otherwise met up with a friend, gone for walk and a jog, done some ballet, read a book in the garden, lazed around in the sun, played endless music and had a lazy and restful weekend. I cannot recall the last time I felt this relaxed, but it hasn't been for months. The sunshine helped - although it had become a bit too hot and humid. I am beginning to realise where I want my life to go and that I have come off the fighting-line in physiological needs with my EDSIII and now moving up a notch to a newer and higher quality of life. I can see all sorts of doors opening and new opportunities coming my way. Life feels good and it is good to be me. I saw the Urologist today. Despite surgery and other investigations including trial of Vesicare tablets (for over-active bladder, which didn't work for me) it seems we might have an answer for these strange episodes I have of needing to pass urine constantly (15 times in 90 minutes), late evening, and also why I need to pass urine at night. It might be that my body is "physiologically confused"(!) and that my bladder is much more active later in the day than it should be. In order to prove this test I need to measure precisely what I intake and output over a three day time period. If the information shows that I output much later in the day (which is what we predict) then it will confirm this "physiological confusion". I am not sure what the diagnosis is, or if there is a name for the condition, but my Urologist did say there would be an appropriate medication to take which should solve the problem. So I have put up with this for over 30 years and might finally have a real reason for it. Apparently my bladder capacity is really good, so the Urologist also thought that I am also possibly retaining urine, to an extent. This is something that is related to hyperlaxity of tissues. I am seeing Mr H in a month's time when hopefully there will be an answer to this problem! Mr H did also mention neurological irritation when it came to these odd episodes of continuous need for the bathroom, but fortunately I only get them a few times a month. It will be so blissful if this problem is resolved. Physio and Bowen have both helped in different ways, but only in a temporary capacity. I have just been informed that I don't have physio until 20th (one week later than expected) and I remain calm and in control. Last Friday's jogging problems (left knee, medial pain) are now last week's problems. I took care of the situation myself I self-treated using Bowen to rebalance my pelvis and knee. I went back to walking immediately and then managed a fatigue by just simply sleeping for the afternoon. I was able to do some ballet and then life went on. I have followed my own self-management plan and know that I am confident in managing life's little situations as they arise and present themselves. Having drunk a lot of alcohol in the week, I knew it wasn't suiting me, so I stopped and had a night off, even though I was with others who were still drinking. I have felt good and in complete control of my body (and mind). I have made huge progress in recognising all these things including my acceptance and management of pain. My new physio exercises are causing me some training pain, but I am understanding that this is now essential so that the last pieces of the jigsaw can be puzzled. I am enjoying being in my body and watching this dialogue unfolding as the spiralling exercises work to strengthen and loosen the area of inhibition in my Thoracic Spine. There has never been any gain without pain throughout my entire story. The more I understand and accept what is happening, the more I am able to tolerate the situation without the level of upset that would have been the case over a year ago. This is a huge step forwards. Today I did ballet in the centre (no barre work) and danced with more precision and strength and control than I have ever done before. Although this is only from home and not in a studio session, I know that my hard work will transfer back to class, and I look forward to doing this again very soon. I believe I am now going up a notch in my own health and well-being (musculoskeletally). It has taken over four years of enormous hard work and dedication from those involved. I cannot jog for another few days as I am waiting for my new trainers to arrive, but a bit of medial knee pain won't put me off - if it re-appears I will triage it again until other help arrives, but I will not get upset about it or let it spoil my day. I will simply wait and do other forms of exercise until I can jog again. I am also looking forward to trying other new sports again as my confidence increases. I am now in a better space again than I was, and that feels good. Happy Days, (as my physio might say :)). I had an interesting physio session today. M decided to work down my right lower limb and then up the left lower limb. He is working on various spiralling patterning in me. All this lower limb work involved a lot of calf work and I coped really well and in fact it was the first time for me that it was finally hardly an issue. I got through any difficulties with use of breath for relaxation. The fact that M had explained to me some weeks ago that my sensitisation of (an overly) sensitised central nervous system aka chronic pain would bottle neck in my calves (due to previous traumas) has really helped me to understand when and why they become 'wired.' However it is a huge breakthrough that I am now allowing M to work on them properly without throwing the kind of fit I would have done not so long ago. For me understanding things is the key to breaking through these kind of issues. A lot of work has been done on the whole calf issue over the past few years. Latest measurement of calves now leave only 2cm between right (38cm) and left (40cm) legs. Our hope is to reduce this gap by a further 1cm, which would be normal. M did some work into right obliques, psoas/diaphragm and then set about giving me two exercises. One is being on all fours and simply extending the lower limbs (whilst remaining weight-bearing). The other exercise involves putting one arm out to second position (whilst kneeling on all four) and then me following the arm with my head/neck, thus involving upper thoracic and this new area of sensation we are awakening in upper thoracic spine. It is an extension of the first spiralling exercise given the other week. I then repeat this to the other side. M also asked me to re-start my psoas exercise in addition to my other staple core exercises. I am feeling really positive at this stage in the treatment and can now see some kind of end stage when all remaining faulty patterns have been removed and final areas of rehabilitation (including TMJ) take place. Then I will just need physio for maintenance only. I am continuing with all cardiorespiratory work, carefully pacing up activity. I have come a very long way in my musculoskeletal rehabilitation over the past 4 years.